Striker Sam Vokes has urged the Clarets to turn Turf Moor in to a fortress ahead of games against Hull City and Watford this month. 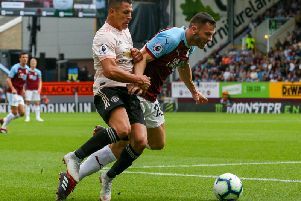 Sean Dyche’s side responded to their opening day defeat to Swansea City by making home advantage count in their next outing against Liverpool. “They are massive games for us,” he said. “The other week against Liverpool showed we need to make Turf Moor a bit of a fortress for ourselves, because away from home in this league it’s always going to be tough. Burnley went into the international break with three points from their first three fixtures back in the Premier League, and Vokes feels that first win will provide a huge psychological boost. The 26-year-old was quick to identify the value of scoring the first goal in games at this level. The Welshman’s opener against the Reds provided the Clarets with an advantage to defend, as opposed to how the game panned out versus title hopefuls Chelsea at Stamford Bridge. “Chelsea are a difficult team to break down at the best of times. When you go 1-0 down it’s always going to be tough. Against Liverpool we got ourselves ahead early doors and we had something to hold into. “Against Chelsea. They scored early and it was always going to be an uphill challenge from there.